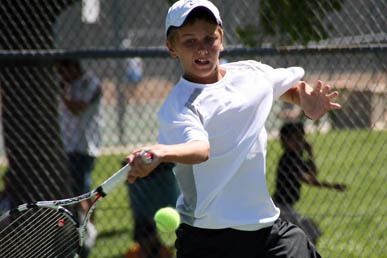 USTA Southwest junior player Nathan Ponwith was recently tabbed for a prestigious international travel team for 12-and-under juniors. The 12-year-old Ponwith (Scottsdale, Ariz.) - who recently reached the finals of the Boys 12 Clay Court Championships and won the doubles title at that event in late July - was chosen to represent the United States in the fourth annual "La Coupe Le Blanc - The Le Blanc Cup". The 12 and under team event takes place on Monday, August 16th to Sunday, August 22nd in Montreal, Canada. This is an international invitational event and the draw is limited to 16 boys and 16 girls from 8 different nations. The USTA selected Ponwith as one of four total members (2 boys, 2 girls - see list below) for this select team. Ponwith is currently the No. 1 ranked 12-and-under junior boy in the Southwest, and No. 4 nationally in that division. Good luck to Nathan and congratulations on the selection!